Will the UK get a little fibre in its infrastructure diet? Gordon Brown has hinted that he may be prepared to invest in Britain's broadband infrastructure, insisting that the information network is a 'very important thing'. The British Prime Minister compared the British communications network to the railroads, believing that investment will be anti-recession measures that stimulate the ailing economy. "When we talk about the roads and the bridges and the railways that were built in previous times - and those were anti-recession measures taken to help people through difficult times - you could [by comparison] talk about the digital infrastructure and that form of communications revolution at a period when we want to stimulate the economy," Brown told The Observer. "It's a very important thing." Although it is early days, should Brown put his money where his mouth is, Britain could see the roll out of a fibre optic infrastructure to take the kingdom onto a more modern communications plane. The Broadband Stakeholders Group – a government advisory body – said back in September that such a move could cost anything up to £30 billion. 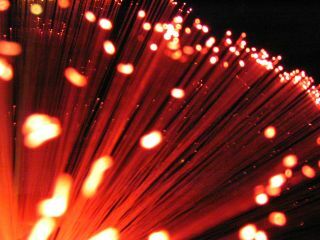 However, the suggestion remains that taking the hard knocks now would at least put the UK back in competition with many of the countries that have already taken the step up to a fibre optic network.